“Indigo crests unfold in a lavender dawn that pales into the infinite horizons of morn. Pink rays of sunrise slide over a fading Chestnut barn as craftsmen toil wholesome in the sweet embrace of mountain air. The clean fragrance of wildflower floats on crystal creeks tumbling down ancient hollows and tasting fresh on the tongue. 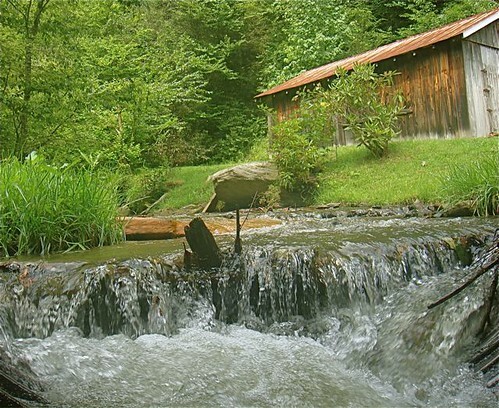 This is the Blue Ridge, where things are built to last. 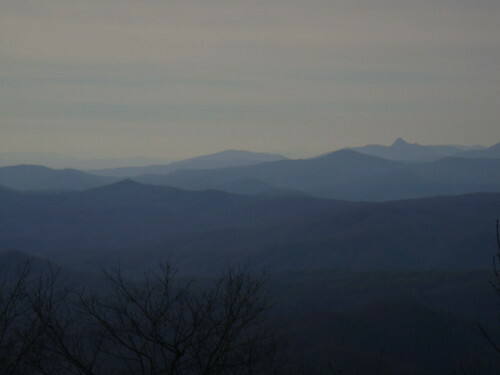 These mountains are islands forgotten in America’s mad rush south and west. This is the most ancient land mass on earth and old time values still reign. Men and women work in friendly, honest labor with wood and cloth using the traditions of our ancestors amidst the timeless forest and stone. Our privilege is to bring the Blue Ridge to you through time honored, handmade creations of skilled mountain craftspeople. One of a kind toys, quilts, paintings, accessories, picture frames, clothing and artwork, are each individually crafted by proficient, skilled hands and brought to you through the Blue Ridge! Timeless value, personal service and real care is our heritage up here and we have not forgotten. We bring you these old time traditions in a modern world where you are not forgotten. We proudly share the stories of our ancestors and humbly offer their gifts from the past for our lifetimes and generations ahead. Beautiful tables are a wonderful addition to any home. 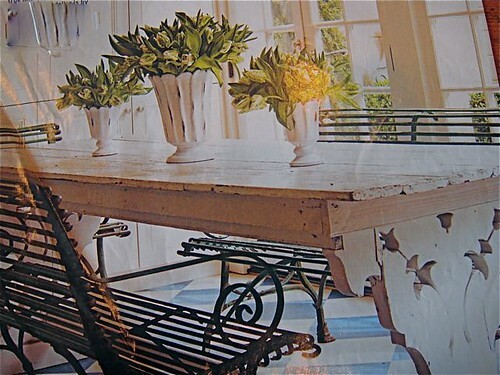 This photo in House Beautiful of an antique stared me thinking about tables. A great table is a tool (I work often at our dining room table), a decoration, a social instrument, a talking point, a work of art and a center for family gatherings. Plus tales can be a good investment. Good tables do not lose value. Every year their patina makes them worth more. Few prized possessions can be as important as a table. So good tables can cost a lot. 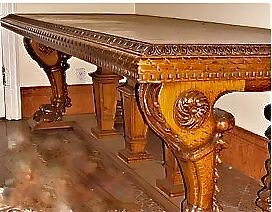 Recently I was looking on eBay and saw this oak table for sale at $14,500! Wouldn’t it be nice to have a better table… one uniquely yours at a fifth the cost… or less? Our Land of the Sun Foundation was created to help stimulate employment and for years have been helping create jobs and educating youth in Ecuador. We donated a hotel that creates considerable employment in Cotacachi, Ecuador. We sell fresh Ecuador roses and lilies which helps stimulate employment. Then we donate all proceeds to help educate children in the same area. However, this oak table started me thinking about how we could help employment in the Blue Ridge and at the same time helping the environment and our readers who would like a Beyond Table. Here is an unusual opportunity for you to own a Beyond Table-something better than you ever desired, a table that is more than a truly. A table at a truly low price… an heirloom of your own making. Most tables for sale in the US are made from wood cut in the US and shipped to China. The table is made there and shipped back to the US. This is wasteful, requires a lot of energy and creates a lot of unemployment in the US. 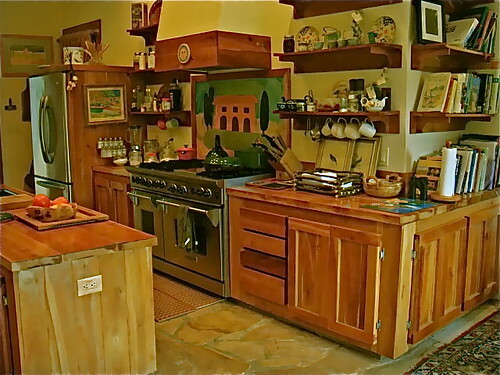 You would know the craftsman, from the tree to delivery in your home and would add your input. Your Beyond Table becomes a unique event rather than a hunk of Chinese processed wood. Beyond Tables are a thing of beauty, an environmental statement, an energy savings, a satisfying natural process and the exact table you desire… which is why I call them Beyond Tables. Beyond Tables are events… your unique individual event…. 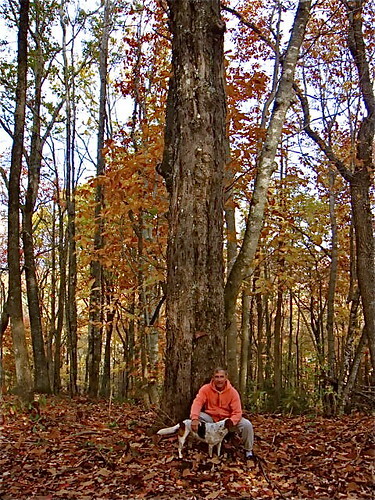 complete with photos… craftsmen, the tree… the process, from beginning to end. Here is how we decided to see if we can turn this dream into reality. 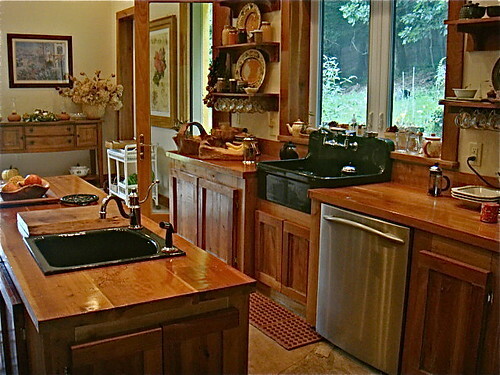 There are some great craftsmen in the Blue Ridge. They made North Carolina famous for its furniture before the craft left for the Orient. We are creating a Beyond Table model, donating a test workshop so local craftsmen can build a Beyond Table for us and perhaps for you. 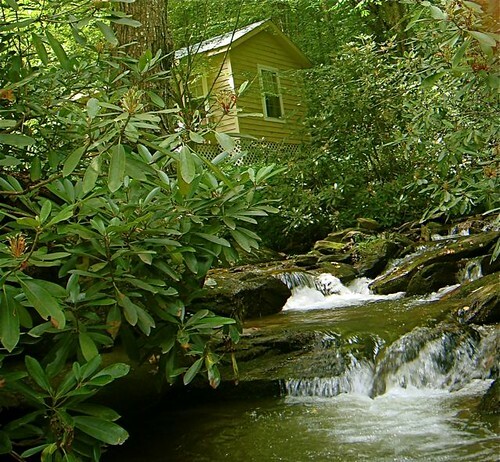 Nearby is a cabin you can use at no cost (our donation) if you need to stay overnight in the process of selecting your tree and reviewing your desires for your table. Here is the cabin. We have over 200 acres of forest and have invited a woodsman to help us select trees that need to be harvested for good forestry management. This is the other benefit of Beyond Tables. 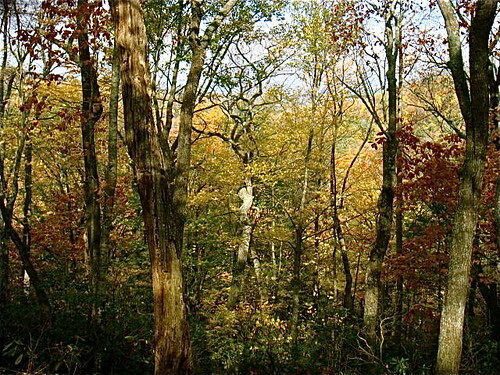 The wood in Beyond Tables was taken to help regenerate the forest. 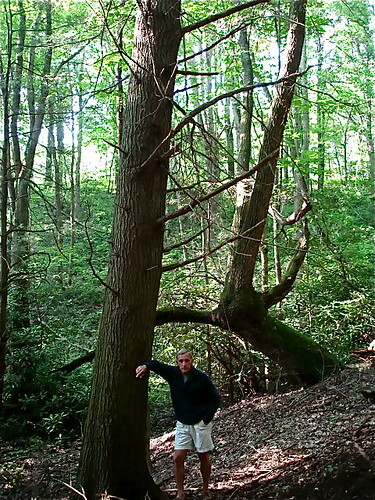 We have trees of every type. We’ll let you and the craftsman decide which wood and tree (from those that need to be culled). You can select the design of the table and review it with your craftsman. You can see some design samples here. This is the site of Hawley’s fine woodworking. They have nothing to do with our program. I chose their site simply because they have some fine looking tables. 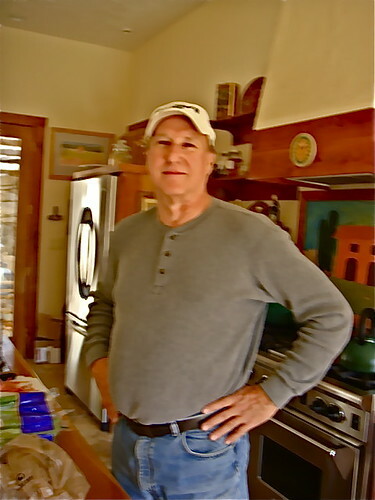 Lester Pennington. 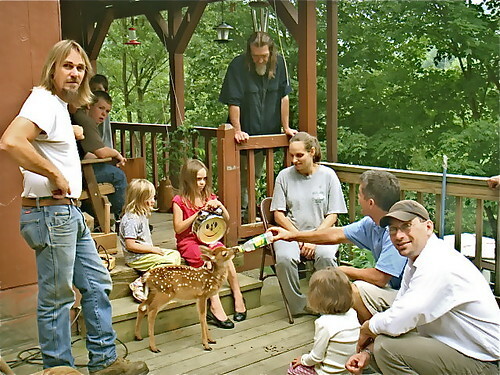 This shot was taken recently when Merri, I and our son Jake visited Lester (far left) and his family at their home. 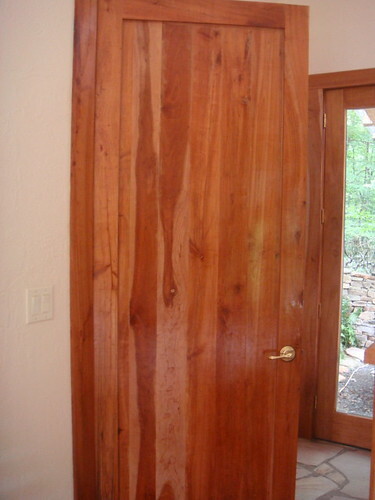 even the oversized inner doors in our house were made in cherry by Richard and Lester. 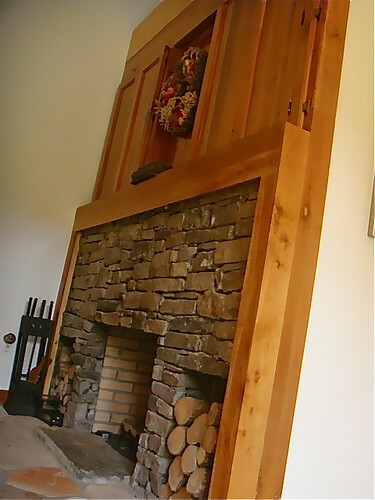 They planed and trimmed it all from rough cut local wood. 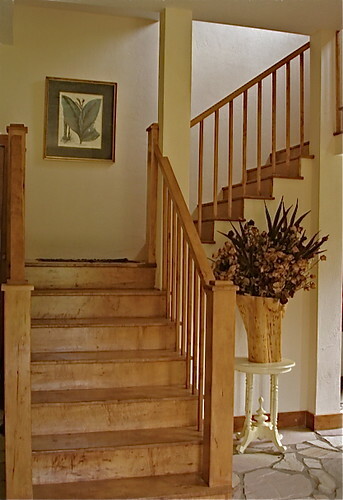 Our stairs and staircases in maple were prepared this way by Richard and Lester as well. 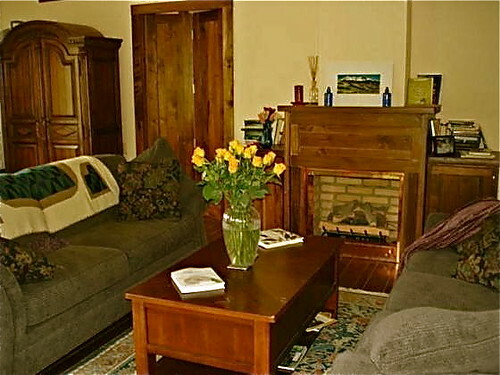 Plus our upstairs floors, fireplace surround and cabinets are in black walnut.